Holy cow, you guys! I heard from so many of you after my recent show (5 Ways to Grow in Patience) and you were all about the fasting. I mentioned in that show that I believe fasting is a helpful way to work on becoming more patient, and many of you wanted to know more, so let’s talk about all the spiritual benefits of fasting. Fasting empties us and prepares us to receive God … We grow in trust in God and wait for HIM to fill our needs. This is the main thing we are called to do as Christians—deny ourselves and focus on God and others. Fasting teaches us to not seek immediate gratification. You are not going to die because you feel hungry. 2. Through fasting, you gain power over physical desires. We are meant to control our physical passions with the use of our reason, and fasting is a practice in exactly that. If you can master your hunger, you can master your anger, lust, pride, and so on. 3. Fasting helps you grow in gratitude. It’s hard to be grateful for food when we are constantly eating it and never truly experience hunger. We don’t even really enjoy food when we are eating very frequently. Fasting teaches us to appreciate food, but also many other blessings and pleasures in our lives. When Jesus went into the desert to pray, he fasted too. Prayer and fasting go hand in hand. You can offer up your fasting for yourself, for your marriage, for a friend, for the Church, or for some special intention. It’s powerful! 5. Through fasting, we gain strength to do hard things. The practice of fasting teaches us to accept suffering that comes our way and be patient in it, because we know it will not last forever. It’s a discipline that teaches us to trust in God for our strength. 6. Fasting empties you and prepares you to receive God. Are you experiencing any other spiritual benefits of fasting? Let me know in the comments! 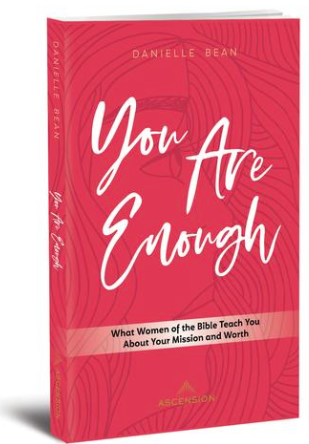 My newest book, You Are Enough: What Women of the Bible Teach You About Your Mission and Worth, is available for order! Use the code, GIRLFRIENDS to receive ten percent off your order. An audio version of the book is also coming soon! I can’t wait to share this book with you! Want me come to your community to speak or give my retreat, You Are Enough, based on the themes in my newest book? Get all the information here!